The Seated Liberty design of Christian Gobrecht was first placed on the U.S. dime in 1837, and continued until 1891. In 1870, the fabled Carson City Mint began operations, with the production of quarters, half dollars, and silver dollars. The first Seated Liberty dimes were not coined at Carson City until 1871, when a paltry 20,100 were released. This came when pocket change was gobbled up quickly by a coin starved population living in the western United States at the time. Not many examples were set aside for future posterity. It's hard for collectors today to understand that collectors in the late 19th century paid little heed to mint marks. This began to change in 1893 when Augustus Heaton published Coinage of the United States Branch Mints, where he drew attention to the goal of obtaining examples from individual branch mints. As best we can determine, the scarcity of the 1871-CC dime was first publicly recognized in the auction brochure of the New Jersey Sale in 1898. Within a few years, collectors began to furiously compete for examples of the 1871-CC dime; the problem for them, and for us today, is that there simply were not enough of them to meet demand. An analytical tool used by coin experts to foil alteration fraudsters is that the reeding on the Carson City dimes from 1871 are wider than their Philly and San Francisco counterparts. The 1871-CC Seated Liberty Dime is rare in any condition, is of historical significance, and is one of the most valuable key dates in the lengthy Seated Liberty dime series. The 1871-CC Liberty Seated Dime was the first U.S. dime coined at the Carson City Mint. It rates as one of the great rarities of the Seated Liberty Dime series of 1837-91. However, when compared to the Rare Coin Values Index, it falls below average. Compare the blue line above, which charts the percent value increase of the 1871-CC dime since the Year 2000. The red line is the Index performance over the exact same time period. 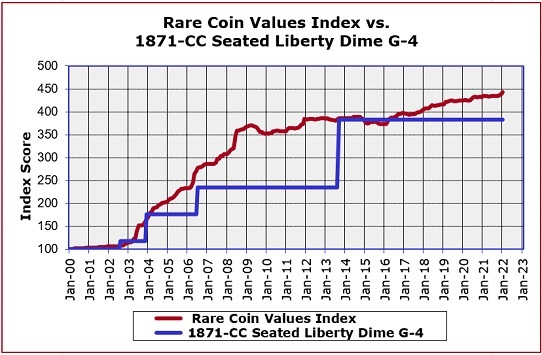 The Index graph is based on the overall percent change of a representational group of 87 rare US coins, which includes the 1871-CC Seated Liberty Dime. This is not to say the 1871-CC dime is to be avoided... not at all. It is a very desirable acquisition in all grades, but there are other coins in the Index that have actually outdone the 1871-CC dime. The Index is updated monthly.